Express Scripts and CVS Health have released their highly anticipated formulary exclusion lists for 2018. Although CVS Health states that they will not finalize their list until September 15, they have published the expected formulary exclusions, indicating that the autoimmune and hepatitis C categories may change. PHSI analyzed the exclusion lists to note trends and changes over time. Including combination products (e.g. Benicar and Benicar HCT), CVS Health added 21 products to their exclusion list, while Express Scripts added 68 drugs. With many blockbuster drugs losing brand exclusivity in the past few years, it is not surprising that the 2018 exclusions lists are rife with multi-source brand products. Of the 68 drugs added to Express Scripts’ formulary exclusion list, 50 were multi-source brands. Meanwhile, eight of CVS’s twenty-one exclusions have generic alternatives available. On both the CVS Health and Express Scripts’ lists, commonalities exist with both PBMs adding Effexor XR, Seroquel XR, Zetia, and Benicar/Benicar HCT to their exclusion lists. Because lower-cost generics are now readily available for these products, excluding these brands will lower costs. Specialty drugs may be the new frontier of drug innovation and account for the majority of new product launches. See PHSI’s previous newsletter article, “2016: The Decline of New Drug Approvals and Increase in Expedited Reviews”. However, specialty drugs were not overly abundant on the 2018 exclusion lists. Both CVS Health and Express Scripts each added four specialty drugs to their 2018 exclusion lists. CVS added Elelyso, Follistim, Synvisc, and Synvisc One, while Express Scripts added Sandostatin LAR Depot, Signifor LAR, Neupogen, and Forteo. For Express Scripts, one of the most interesting exclusions was epinephrine auto-injectors from A-S Medication, Impax, and Lineage. Express Scripts appears to have partnered with Mylan to promote the EpiPen and generic Mylan epinephrine auto-injector, which are the preferred alternatives. CVS Health does not include either the EpiPen or generic epinephrine auto-injectors on their exclusion list. However, in the past year, CVS retail stores have been promoting their low cash price epinephrine program, which provides the Impax/Lineage epinephrine product to patients for approximately $110. Based on the success of that program, it is not unusual to see the epinephrine market divided amongst the PBMs (CVS and Express Scripts) and manufacturers (Mylan and Impax/Lineage). New exclusions were not the only changes seen on the 2018 lists. CVS announced that 18 products are being removed from the exclusion list, perhaps due to shifting costs or increased rebates from brand manufacturers. Of the 18 items being re-added to the formulary, 13 will be placed on a preferred drug tier, while the remaining five will be placed on a non-preferred tier. The items being removed from the exclusion list are shown in the chart below. 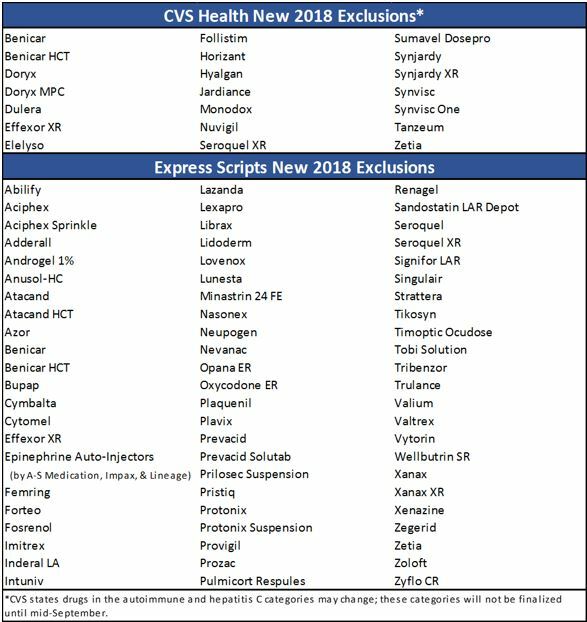 Based on prior exclusions, Express Scripts notes that a total of 159 drugs are now included on their formulary exclusion list. Meanwhile, CVS appears to have approximately 180 products on their exclusion list, although this may change when the autoimmune and hepatitis C categories are finalized mid-September. It will be interesting to watch the exclusion list changes in coming years, especially as biosimilars become more prevalent. The chart below lists new products on the CVS Health and Express Scripts 2018 drug exclusion lists that were not present on the 2017 lists.